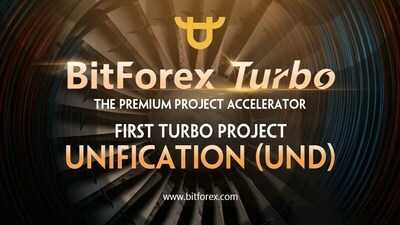 SEOUL, South Korea, April 11, 2019 /PRNewswire/ -- Global one-stop financial services platform leader BitForex, announced their new IEO service platform "Turbo optimization". The IEO (Initial Exchange Offering) is a listing method designed to minimize the side effects of the ICO, which is the method of raising funds in the existing crypto-currency market. The ICO's weak verification capabilities for the project have led to fraud and other problems, adversely affecting the trust of the blockchain and crypto-currency markets. BitForex Turbo aims to offer high-quality industry projects by curating blockchain projects with strong values, innovative or pivotal tech, and high potential from, around the globe. Currently, BitForex, Huobi, and Binance are the only exchanges to offer such programs. In the past year, a large number of ICO projects with no value have been born, whic has greatly impacted the confidence of the overall industry and triggered the arbitrary trampling of the market values. Huobi Prime and Binance Launchpad offer the same features as BitForex Turbo. Through careful curation, efforts such as BitForex Turbo can help cut down on industry chaos and negative energy, giving investors confidence and a better way to identify strong potential projects in an over-saturated market. The first project through Turbo initiative is UND. In the second half of 2018, Unification obtained investment and incubation from renowned overseas investment firms Yellow Captial and Gems Captial. Yellow Captial is founded by Alexis Sirkia - former 50% partner at GSR, the famous market making firm behind XRP. Yellow has taken on UND and is aiming to replicate the XRP success story. In terms of the mainsteam media -- they hope UND will causally be referred to as "Bitcoin for Enterprises". UND's core technical teams are from the world's top companies and have many years of experience in implementing European and American related projects. CEO Neyma Jahan, CPO Maziar Sadri, and CTO Paul Hodgson have worked together for over 10 years on many successful tech products. Previously, team member Mazi Sadri was product manager at Yahoo with over 500 Million users under his watch -- a position directly under Brad Garlinghouse, founder of Ripple.